While in Aruba, I discovered a new sport that combines everything I love about sports. Take the fun and fast-paced sport of tennis, add a volleyball court, and a sunny beach setting, and you have the new, exciting sport called beach tennis. 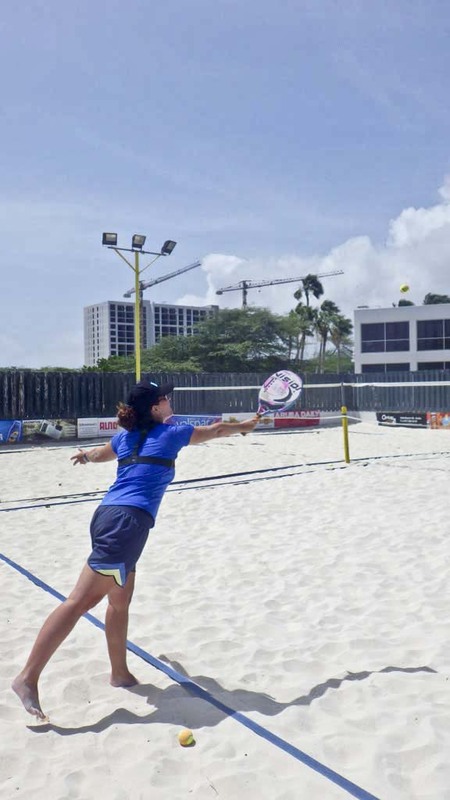 It’s like tennis except its played on a regulation beach volleyball court, and it’s a create reason to visit Aruba. Two to four players on each team volley back and forth without letting the ball bounce. One hit per team is all that is allowed and points are scored when the ball is hit outside the lines or touches the ground. Beach tennis is played with specially designed paddles and de-pressurized tennis balls that make it easier to keep a rally going. After twenty minutes of instruction, I was ready to test my skills in a match and after two hours, I wanted to add “play beach tennis regularly” to my bucket list. I think I found my new favorite sport. 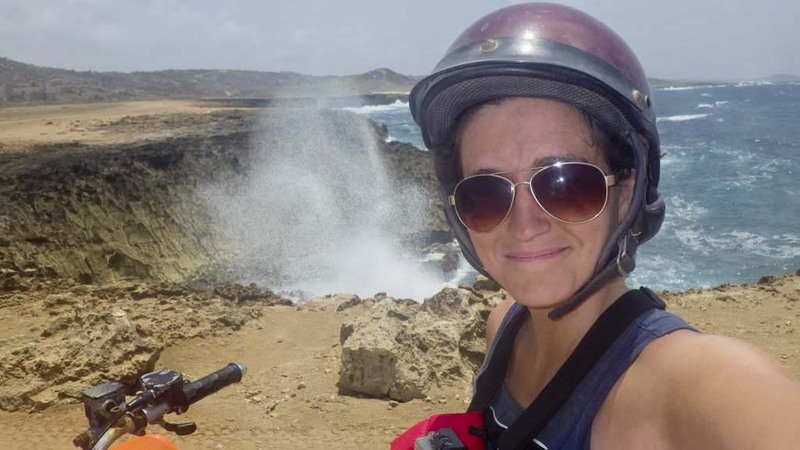 We explored Aruba’s north coast open air on an ATV tour with Action Tours Aruba. During our rugged, back-road ATV journey, we winded our way through sandy paths, imposing hills, seaside cliffs, and wave-tossed beaches. We explored caves and Aruba’s Natural Pool. Our half day tour gave us time to get comfortable with the ATVs and experience the true beauty of Aruba. Adventure, beauty, swimming, caving, and perfect weather come together to create one heck of a great day. Delicious Aruban food, handicrafts, drinks, a center stage of activities, and a mini Mardi Gras of dancing, customs and music create an explosion of fun in Aruba. 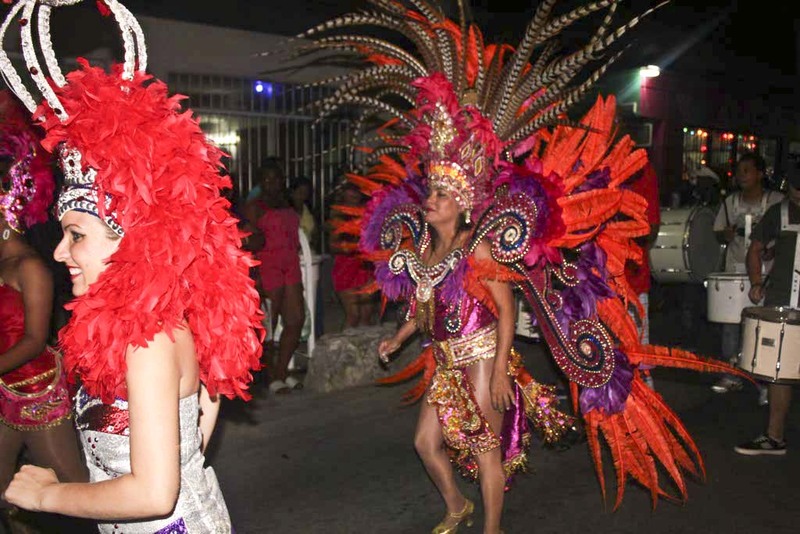 The coolest part – it’s a regular Thursday night at the Carubbian Festival of Aruba. The Carubbian Festival takes place in San Nicolas every Thursday night from 6:00 pm – 10 pm, showcasing the multicultural charms of Aruba. Closed to traffic, the main street becomes a paved stage for dancers, including me, and live, interactive entertainment for the whole family. People wait a whole year to celebrate Mardi Gras but it happens every Thursday night in Aruba. How amazing is a country that celebrates every Thursday? Imagine what it would be like if it happened everywhere? I was able to discover incredible coral formations and schools of tropical fish as I snorkeled with De Palm Tours. Others followed a professionally trained SNUBA guide on an underwater tour of the beautiful marine environment, including a shipwreck. The warm, clear blue waters created the ideal conditions for exploring the world below the surface. Even when we weren’t under the water, the sailing tour was equally amazing. It included a wide selection of alcohol and a scrumptious lunch. Since it was a large catamaran, no one felt any motion sickness and it was appropriate for all ages. You haven’t seen Aruba until you’ve viewed it while sailing along the coast and De Palm Tours really opens your eyes to everything that the One Happy Island has to offer. 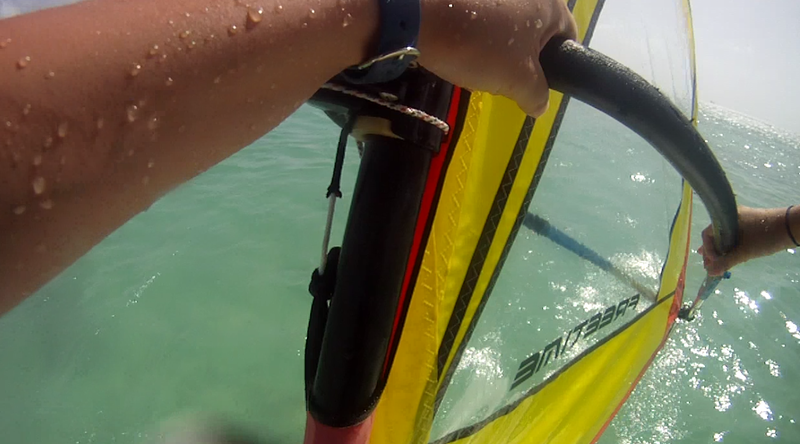 ‏Number 1 – Windsurfing Out of all of my Aruba adventures including dancing through the streets at Carubbian Festival, exploring the wilds of the northern shore on an ATV tour, snorkeling and Snuba, beach tennis, and windsurfing and SUP, I loved windsurfing the most. With the perfect combination of instruction, wind strength, and water conditions, Aruba was the ultimate place to practice windsurfing. The instructors were phenomenal and gave each of us individual practice time before letting us try on our own. After a quick, land briefing, we headed into the water for some one-on-one instruction. The sail was smaller than I used before, making it easier to get it out of the water and position it in my hands. I felt extremely comfortable from the minute I entered the water because it was waist deep and perfectly flat. I wasn’t worried about going too far or being in over my head, literally. There were easily noticeable buoy markers to let us know when we were getting a little too far out, but they were such a far distance from the shore that I never reached them anyway. I love being physically active on vacation; combine that with any water sport, and I’m guaranteed to have a great day! Did you ever visit Aruba? If Aruba is on your bucket list and you’re looking for more experiences, check out these other unique things to do in Aruba. This is the first time I’ve heard of SNUBA! That’s a cool way to combine snorkel and scuba. Also, you totally didin’t even need 5 reason to convince me to go to Aruba; each one is great on its own! SNUBA was really cool, but to be completely honest, I chickened out while in the water. I felt like I couldn’t breathe and I ended up snorkeling instead. I’d like to try again soon though. There is a beautiful world under there that I’d love to explore. 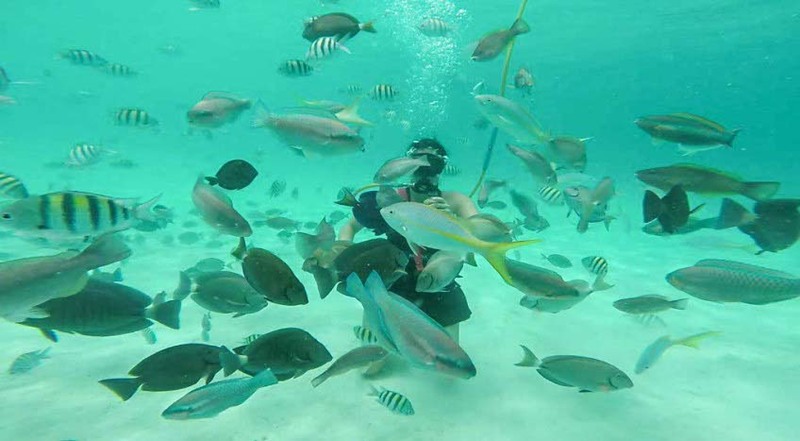 Have you tried snorkeling or scuba before? My husband and I tried snorkeling once, and we figured it was time to go all the way to SCUBA! We love it, and I *highly* recommend full-on diving over snorkeling. You can do it! Love the new word: SNUBA. Aruba sure looks like the perfect vacation destination. OK, I’m convinced! Book my ticket. I’m ready to see it all. You really should go; it’s truly amazing. What is your favorite vacation spot? Visiting Aruba and diving some of their sites is definitely on my bucket list! Great article. Looks like you had a fabulous time! I’m certified through SSI (Scuba Schools International). I have my OW, AOW and Diver Stress and Rescue certs with SSI. You should definitely go for it! Get your cert with your husband; it’ll change your life. My husband and I dive together, and now our kids (ages 15 and 13) dive with us too. Amazing family times!! We just booked our annual work trip and all 28 of us are going to Aruba. 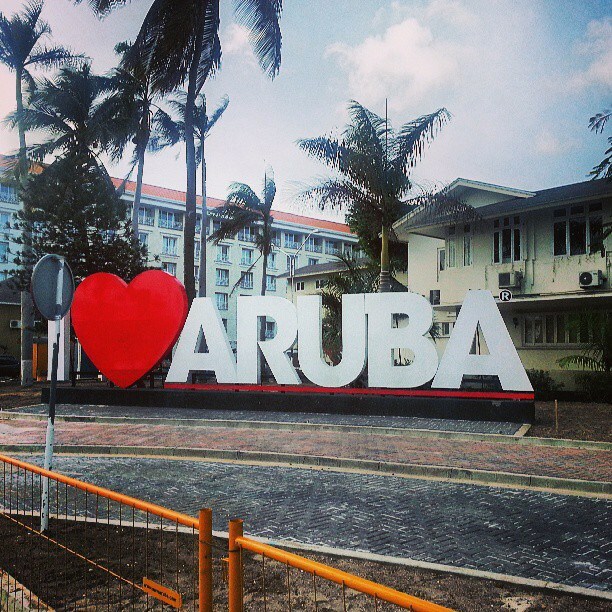 We’ve been following along on your travels and liked your Aruba posts the most. Thanks for sharing. We’ll keep you up to date on all of our fun there. Maybe someone will even submit an article! Such beautiful scenery and so many different and fun things to do! Looks like a wonderful place to spend a vacation!! I have never tried this sport! I miss sports so much now & hope that getting ready for next summer won’t be a problem as I get my body ready for it. Love competing & learning of new sports sometimes except for the ones that make me feel like I have no control as if I was skydiving or bungee-jumping. I love your posts & think they are quite good as I learn more about new places to travel to. Thanks for giving of yourself & hope to have a few more done on my blog. I have a couple more on mine about health & how fun it is to be rich in your body & in wealth sometimes. I think playing beach tennis is or would be harder somewhat to control when I used to play volleyball a lot too a few years back. I am now getting ready to make my body return to sports & try new sports out that keep me on the ground more than in the air. I would think that when we finally don’t need to have any gravity & are light footed somewhat, I would try something in the area of doing what you can do with an elastic cord that is so long & can just float around in air more.